Grandpa Luis often told me stories about growing up in Mexico. My family lived in the in-law apartment of his big, white colonial house from the time I was three until the time I was five. He told me how their dogs lived on the roof to guard against intruders; how the government tortured his father to death during the revolution; how his mother sent each of his siblings to the seminary, and out of eleven, only two actually became priests; and how the Brothers at the seminary whispered about how deep in prayer he was as he slept in the pew. My favorite stories were about his medical school mariachi band, La Tuberculosis. He would sing me the songs in Spanish and translate them into English: I love you my darling, so please accept this lung-chunk. I coughed it up for you. The officer asked to see their permit. The officer brought them to his house, and they played it for her. And then another. And another. The officer made them serenade his wife all night, but a day of classes tired from playing music is infinitely better than one tired from a night in jail, not to mention what his mother would have said if she found out. He kept playing music in America. 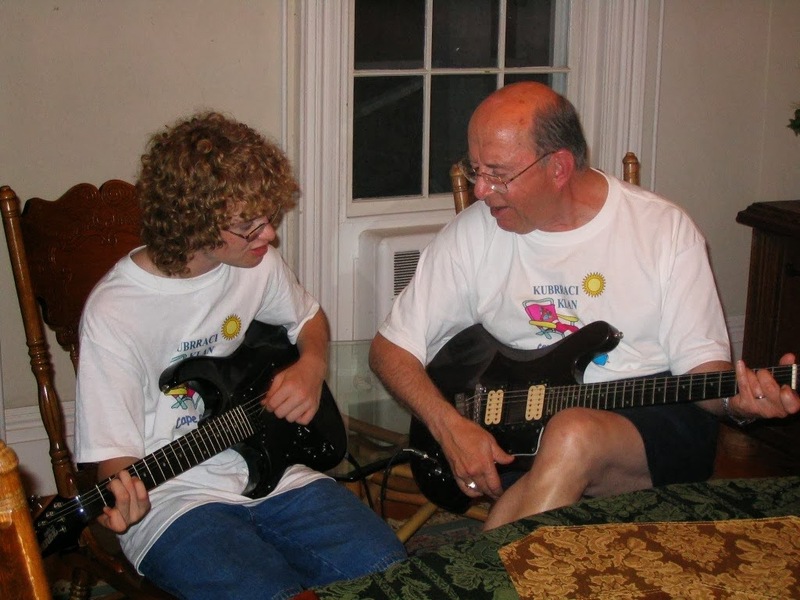 He would play guitar and sing with my Aunt Debbie when the family got together, especially around Christmas time. He loved music. A lot of people had trouble understanding him because of his accent, but picking out the words was natural for me. Once I started playing guitar, he and I would play together. Of course, I wasn’t good enough to play much of anything at the time, and his sight was going, but we made it work. When he lost his sight, the state forced him out of practice, so he trained medical students to become doctors. One day he came in slurring words and his trainees caught it. They told us it was probably a stroke, but it was a malignant brain tumor. After the surgery, they weren’t sure if he’d know English or Spanish or any of the five languages he spoke. After the surgery, he seemed like he remembered all of them, but each day a few more words slipped out of his vocabulary. It wasn’t bad at first. Who cares what he called a tea cup? At Thanksgiving the names went. He hugged us, but the names were jumbled. He called Joe “Louis” and Kathy “Annie.” He broke down in the kitchen. My Uncle Joe was holding his left arm and my Aunt Kathy his right. My Aunt Kathy squeezed his arm in agreement. None of them saw me, standing at the edge of the kitchen. I wanted to jump in. I couldn’t pick out the words to make it better. Instead I walked away. Knowledge is the only thing that no one can take away from you. Every night a different child stayed the night with my grandparents. My grandmother was going crazy taking care of him and dealing with the pain from her diabetic foot sore. She wasn’t willing to stay in bed so her foot could heal while her husband died. Wednesdays were my mother’s days. She’d take him to get radiation treatments and then back to our house for family dinner. I’d get out my guitar, and he wouldn’t want to play, so I played him song after song while my mother cooked. I showed him the things I thought he would like. The Beatles. Elton John. I didn’t sing at the time, so it was all just chords and accompaniment. After I exhausted the five or so I thought he would recognize, I’d play the stuff I wanted to play. Joe Satriani. Steve Vai. Yngwie Malmsteen. Speed metal and instrumental guitar songs. The last time I saw him, they’d brought a hospital bed into his entertainment room. He’d bought a sixty-inch television right after he went blind, and he’d put his nose on the screen to see the soccer players. His hair and his vocabulary were gone. I didn’t know it would be my last time seeing him, but around then, every time I saw him felt like it would be the last. I hugged him. He didn’t say anything. All the words were gone. I squeezed tighter. I looked down at him and felt the sting of dryness before tears form. “I love you, Grandpa,” I said. He said it again, but I couldn’t pick out the words. I don’t know what he said, or if he tried to say it again after I walked out. I couldn’t take it. I left him there, mumbling. I tell myself he was trying to say, “I love you, too.” The subject is taboo in my mind. Grief, wrapped into a box somewhere on a shelf near the back wall. I should have stayed. I should have waited for the words that weren’t coming. Two days later, my mother ran down the stairs to my father. I didn’t cry that moment or that day. I held it in until the funeral. The weight of the casket shocked me as I carried it down the aisle. My Aunt Debbie sang beautifully, and he would have loved that. My Grandmother’s brother and Luis’s best friend Great Uncle Jim delivered a beautiful eulogy. I remember laughing at a joke about how Jim’s parents made him chaperone all of Grandpa Luis’s dates with Grandma Marie. Then I burst. I dribbled snot on the sleeve of my new suit. I tried my hardest to stop, but settled for not sobbing more than four or five times. Someone rubbed my back. A priest came off the altar to try and comfort me. None of it helped. I’ll never know what he tried to say to me, but after six years the last words don’t seem as important as the ones that came before. Ryan Bradley graduated from the University of Hartford with a B.A. in English with an emphasis on creative writing in May 2012. He has published work in the Missouri Review, Sundog Lit Blog, and at winningwriters.com. 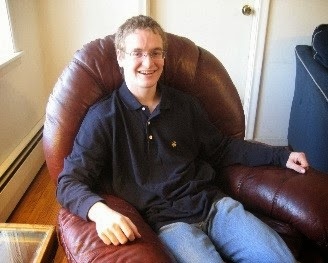 He will start work toward an MFA in Fiction at Emerson College in the fall.